My wife and I just saw James Arrington's farewell performance of his acclaimed one-man show "Here's Brother Brigham." Arrington donned the beard and stove pipe hat for 40 years. He and his wife have accepted a call to serve as senior missionaries and will be leaving soon for Nashville, TN. I love Brigham (1801 - 1877) as I love Joseph (1805 - 1844). I revere them as Prophets of God. I have also studied their lives in sufficient detail to realize they were highly imperfect human beings, like the rest of us. Prophets, like the Church they lead, are partly human and partly inspired. If you fail to see the divine inspiration, you miss the awe. If you fail to see the humanity, you have unrealistic expectations. The person who reasonably balances this humanity and inspiration in their mind can weather the storms of life with their testimony intact. Brigham chewed tobacco much of his life, used colorful language, and practiced racism. He married 55 women, divorced 10 of them, and only publicly acknowledged 16 wives. He also helped convert thousands, led 70,000 emigrants west, founded 350 settlements, established many institutions that are thriving today, and built up a Church that now spans the globe. Joseph's temporal pursuits usually ended badly but he produced more pages of sacred writ than any Prophet in the Bible. Brigham's gifts as a seer and revelator were limited but a more successful administrator would be hard to find. Joseph and Brigham were both partly human and partly inspired. Joseph Fielding Smith (1876 - 1972) was a prolific author although his outdated material is seldom referenced in the contemporary Church. His rigid orthodoxy and arch conservatism would make him a pariah in today's world. His famous statement that man would never travel to the moon was brought up in the 1970 press conference when he became President of the Church a mere six months after Apollo 11. "Well, I was wrong, wasn't I?" was his terse reply. I can't imagine Joseph ever uttering those words. See the blog article "Joseph Smith in One Question." Joseph Fielding Smith was partly human and partly inspired. So how much credence should we give a statement attributed to a partly human and partly inspired Prophet? South American mission records contain statements by Apostles (Spencer W. Kimball (1895 - 1985), for instance) who later became the Prophet saying Lehi landed in Chile at 30 degrees south latitude. It is human nature to travel and say something about the place you are visiting to please your audience. Those brethren who over the years repeated the old myth about the Lehites landing in Chile were partly human and partly inspired. Perpetuating a false tradition over the pulpit was part of their human nature. See the article "The Case for Mesoamerica." Joseph Fielding Smith in 1939 expressed his opinion that the Jaredite Ramah/Nephite Cumorah was in upstate New York. Rigidly orthodox and archly conservative, he espoused the "one Cumorah" theory in the wake of liberal new ideas coming up from BYU. Was Smith perpetuating a false tradition as part of his human nature? I believe he was (see the article Ramah/Cumorah), although I revere Joseph Fielding Smith as a Prophet who held the keys of the Kingdom of God on the earth for 2 1/2 years from 1970 - 1972. David O, McKay (1873 - 1970) had been the larger-than-life Prophet of my youth. I was hiking through Zion's Narrows in 1971 when I received a witness from the Spirit that Joseph Fielding Smith was indeed a Prophet of the Most High. As I participated in the Provo Temple dedication in 1972, the Spirit bore witness to me that the dedicatory prayer authored by Joseph Fielding Smith and read by Harold B. Lee (1899 - 1973) was divinely inspired. I have no problem with Joseph Fielding Smith or any Prophet being partly human and partly inspired. 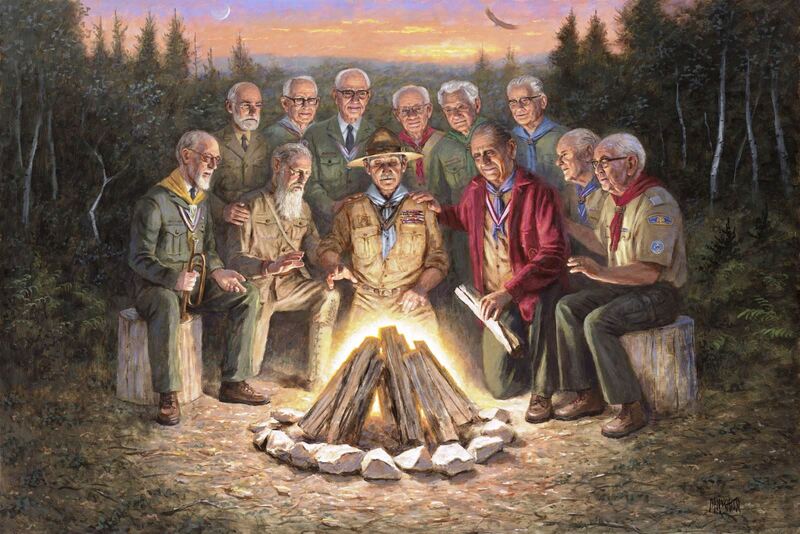 I own a limited edition print of this painting entitled "Sacred Fire" by Jon McNaughton. My great aunt told me stories about visits with Heber J. Grant (1856 - 1945). 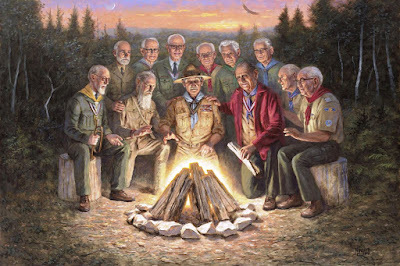 My grandfather was Ezra Taft Benson's (1899 - 1994) scoutmaster in Franklin County, Idaho. Some of my mother's family were students of Harold B. Lee in Weston and Oxford, Idaho. Part of my youth was spent in Thatcher, Arizona where Spencer W. Kimball was an insurance salesman and real estate broker. I entered BYU in 1971 as a Joseph Fielding Smith scholar. I have met Thomas S. Monson in various settings including airports and funerals over the years. I walked with Gordon B. Hinckley (1910 - 2008) back to his car (a Rambler Ambassador) in a BYU parking lot after he visited with a few of us on campus. These are great men, Prophets of God, partly human and partly inspired. Their private opinions about the Book of Mormon are significantly less authoritative than the text itself. The Prophets who authored the Book of Mormon were also partly human and partly inspired, but they lived in the areas and were eye-witnesses to the events they described. They also expressed themselves under divine mandate 3 Nephi 23:13. 3 Nephi 26:12, Ether 4:5 and received inspiration appropriate to their stewardships Mormon 3:20. As Taylor Halverson reminded me, "Catholics say the Pope is infallible, but nobody believes it. Mormons say the Prophet is fallible, but nobody believes it."